A wide assortment of native vines live and thrive in Arkansas. Many of these vines lose their leaves in the winter, others retain their foliage throughout the year, and some vines change colors with the onset of winter. Select species of upward growing vines spread out and cover the ground, and many vines blossom in the spring or summer with vivid, fragrant flowers and berries. The leaves of deciduous vines drop off yearly at the end of the growing season. Trumpet honeysuckle, also referred to as coral honeysuckle, grows from 15 to 25 feet tall. Formed in a trumpet shape, the coral to red colored flowers begin to bloom in the middle of spring along with black and red berries. The Virginia creeper stands 30 to 50 feet tall and grows indistinct flowers and waxy, dark blue to black berries. The 30 to 50 feet tall wisteria vine has aromatic dark blue, violet or white flowers and each leaf has seven to 13 leaflets. The average height of a native Arkansas grape vine reaches 23 feet and grows edible, dark purple grapes. Tiny greenish white flowers adorn the American bittersweet vine, which grows to a height of 20 to 25 feet. The tall Boston ivy or Japanese creeper grows to a height of 30 to 60 feet with unnoticeable flowers and rich blue to black berries. The clematis vine can grow from 5 to 20 feet in height with various colored flowers blooming at the end of spring. The trumpet creeper, sometimes called the trumpet vine, displays orange to red flowers that blossom in July, and this vine grows up to 20 to 40 feet tall. Semi evergreen vines tolerate cold winters without losing its leaves. Cross vine, also called trumpet flower, grows to a height of 30 to 50 feet tall. Fragrant orange-red flowers shaped like trumpets blossom in the spring and in the winter, the leaves turn purple. Semi-evergreen ground covers grow low, cover the ground, and do not shed their leaves in the winter. The Arkansas native Japanese honeysuckle grows to a height of 20 to 30 feet tall. Small black berries and white fragrant flowers that turn yellow grow on the stems. Semi-evergreen deciduous vines retain the majority of its foliage all through the year. Fiveleaf akebia grows to a height of 30 to 40 feet tall with small reddish to purple scented flowers blooming in mid spring. The foliage consists of five leaflet clusters. The leaves of broadleaf evergreen vines remain intact throughout the year and become copper to bronze colored in the winter. Carolina jasmine grows to a height of 10 to 20 feet and produces fragrant yellow flowers in the spring. Creeping fig and climbing fig grows to a height of 40 feet, and these vines require sun to partial shade to mature. Harsh winters kill this vine back to the ground. A broadleaf evergreen ground cover vine covers the ground and retains its leaves year round. The Arkansas native confederate jasmine vine, also known as star jasmine, grows to a height of 10 to 15 feet tall. 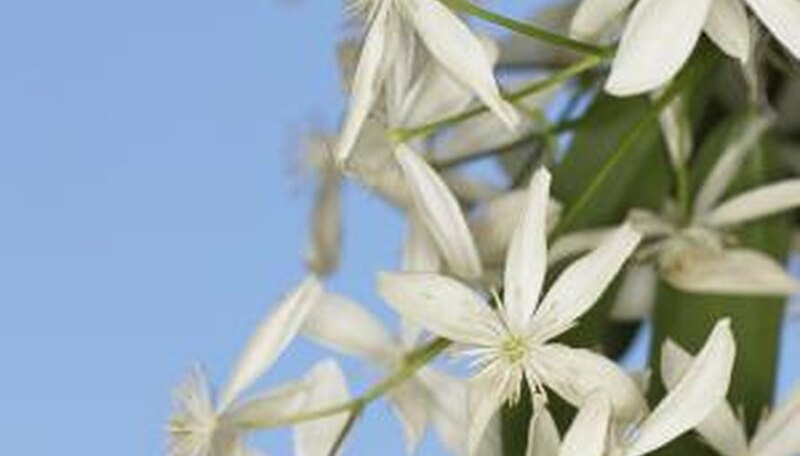 White, fragrant flowers appear in the spring, and this vine may die in the winter when grown in the sun.